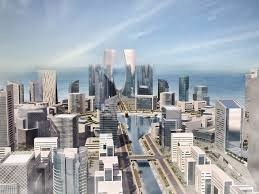 Eko Atlantic City touted severally as a “city rising from the sea” is a proposed city which will sit on 1000 hectares of land reclaimed from the Atlantic sea. Once completed, it will be a self sufficient city with waterfront area, tree line streets, efficient transport system, helipads, hotels, residential areas and boulevard. It will be a development with mixed-use plots that will combine residential areas, leisure facilities, offices and shops. It is divided into 6 phases, the first five of which are available for commercial and residential development, while the sixth will be used as a hub for utility service, such as sewage treatment plants, water supply and solid waste management. According to its developer, the city will help among other things decongest areas of Lagos; build on Lagos reputation as a “land of aquatic splendor; serve as tourist attraction; provide job opportunities as thousands of people will participate in the construction of the city and serve as headquarters for oil companies. It will also serve as resident for 250,000 inhabitants; work place for 150,000 workforces and see 250,000 persons commute on a daily basis. As a self sufficient city, it will generate its own power and fulfill its ICT needs because it will have installed extensive fibre optics equipment, all of these underground. It is not entirely a new concept. Before now, several cities have been constructed on reclaimed lands, some out of necessity, and others purely out of man’s insatiable desire to conquer nature. Modern reclamation work first began with Hong Kong’s “Praya Reclamation” scheme which added 50 to 60 acres of land in 1890. It was one of the most ambitious projects ever undertaken during the Colonial Hong Kong Era. Since then, Hong Kong Disney Resort, Hong Kong International Airport and its predecessor Kai Tak Airport, have all been built on reclaimed lands. Other modern examples include Helsinki, Finland, Mexico City; Foreshore of Cape Town; Chicago Shoreline; Hassan II Mosque, Beirut; Central District, Lebanon more elaborate experiences is the Dubai story. In July 2013, Sri Lanka signed a deal to build a $1.4 billion port city with Chinese Communication Construction Company which will invest $1.43 billion to build this port city. In Nigeria, the first ambitious project of similar nature, although not close in magnitude was the Banana Island Project. These proposed cities have the main reclaimed area, being 7.5km long, with a width of 2.3 km on the Western end, tapering to 0.5km on the Eastern end. Eko Atlantic when completed will be one and have times the size of Victoria Island. Beginning from the shores of bar beach. The boundaries will terminate just before Goshen Estate in Lekki. The outer edge of the reclaimed land will be protected from the sea by approximately 8km long rock revetment to provide shoreline protection to the new land and to Victoria Island. According to Prince Adesegun Oniru, the Honorable Commissioner for Waterfront Infrastructure Development, Lagos State, “The great city wall of Lagos or sea wall will withstand the worst Atlantic storm that could be expected in over 100 years”. The reclamation work on the Bar Beach which began in 2008, currently has a total of 5,000,000 sq. meters or 500 hectares of land area already reclaimed and dedicated by President Goodluck Jonathan. To achieve this, the contractors have pumped about 400,000 tones of sand on a daily basis reclaimed from marine shelf mixed with granites gotten from neighboring city of Abeokuta and ferried by about 90 trucks, almost all of the plots meant for allocation have been acquired. Until the promoters were contacted, the question of actual ownership of the EAC project has been unclear. Information available on different platforms varied. To some, the project was solely a pet project of a particular political Godfather of Yoruba extraction, while to some others; it was a joint venture between Lagos State Government and SENL. Another set of opponents believed it was a LASG’s project and that they just choose to front SENL. One of such opponents, Professor Aradeon (An Arch – Educator in the chair of Build with Earth, an NGO) as said “EACP is a private gated city firmly grounded on the exploitation and expropriation and use of our common wealth for private profit”. Responding swiftly to that, David Frame, the MD of South EnergyX Engineering Limited debunked these claims saying it was a strategic partnership with LASG, a concession which gives exclusive authority over development of the city to SENL. In is word “SENL has a concession agreement with LASG and the duration is 78 years. The funding is through a consortium of local and international banks and also incomes from sales”. Confirming this also the Prince Oniru, said “EAC is owned by SENL. They are the sole owners of that project called Eko Atlantic City; the role that the LASG is playing in this project is clearly a supervision role”. However, this does not mean that LASG has nothing to gain from this project. On the contrary, the representative of LASG has without mincing words acknowledged that they have a lot to gain from the execution, financially and other wise. Chief among these games is a permanent solution provided to the incessant ocean surge that easily beset Victoria Island and its environs. According to Oniru “this project is the life-saver of Victoria Island”. Financially, apart from the fee usually paid for approval of construction, part of the agreement signed with SENL will see LASG get from every land allotted, 5% the value and another 5% as consent fees. This is not to mention the monies accruable as land use tax on each building constructed and other applicable taxes. As relayed by Oniru, “EAC falls within the territory of Lagos and like every other part of the state, would not be granted any concession” when asked about the possibility of the city enjoying any form of tax waiver. Other benefits include the city conferring on Lagos the title of being among the prestigious list of cities built on water and will help among other things decongest certain areas of Lagos. Opponents of these projects have raised certain objections. These groups of organized individuals and institutions ranging from experts, including Environmentalist; Marine Engineers; Legal Practitioners to Human Rights Activists and International NGOs have stated 3 main arguments: the promoters‘ defiance of Conventions; insensitivities to possible negative impact on the neighboring communities and the purely elitist nature of the project. In August 2012, representatives of Heinrich Boll Stiftung; Nigerian Environmental Law Research Institutes and Community Conservation and Development Initiative had jointly presented a report and in it, alleged that LASG has violated the Environmental Impact Assessment (EIA) Act 2004 by summiting Eko Atlantic EIA reports 3 years after the commencement of dredging activities (the EIA Act 2004, provides that an EIA must first be carried out before embarking on any development project). In their words “LASG submitted on the report of the EIA on November 2011, approval from Federal Ministry of Environment came January 2013, while reclamation started 2008”. Secondly, the final draft of the EIA submitted was for Phase 1-Dredging stage and so did not cover construction phase, however piling work for construction of the first building as started. In defense, David Frame had suggested that their action was necessitated by an urgent need to salvage a dire situation. “The rapid erosion of the coastline of Lagos is well documented. Along Bar Beach, Victoria Island in particular, the situation was threatening the very existence of low lying Victoria Island with the collapse of the Costal road, Ahmadu Bello Way in 2005/2006. Emergency action was instigated by Lagos Government (LASG) to avert a pending disaster. Subsequently violent storms could have devastated Victoria Island had the protection not been installed. LASG later publicly justified their course of action” he had said. Oniru on the other hand asserted that “nothing (no part of the process) was fast-tracked. The numbers of Environmental Impact Assessment were done by Royal Dutch Company, Royal Haskoning together with the Federal Ministry of Environment. It is a continuous assessment, as the project progresses more assessments will be done”. As it concerns transparency, these opponents opined in several fora that public engagement was not part of LASG and SENL plans. They had claimed that the several public hearings held by the promoters were not widely publicized and when held, the demographics of the participants did not reflect the requisite stake holders. Victoria Ibezim-Ohaeri, Executive Director of Spaces for Change, an NGO in the forefront of the fight for community participation in development had said about one of such public hearings she attended, that “99% of the participants were government officials, and hand-picked specifically for that purpose”. Frame discredited this statement saying it was “…completely incorrect. In fact the level of public attendance was considerably greater”. Concerning the media used, he said “the event was publicized by direct engagement with identified stakeholders in the press and local radio has instructed by the FME”. Last, but not the least, a lot of people has wondered how much a plot of land cost in the new peninsula. Frame had been quoted on one occasion as saying plots close to the city waterfront would cost $2,000 (N320,000) per square meter, while inner city cost $1,000 (N160,000) per square meter. If we were to go by the fact that David Frame had on another occasion divulged that an average plot in the city would not be measured by normal standard which is 1,000 square meters, but 2,500 to 3,000 square meters. Then an average plot on EAC will go for between $5,000,000 and $6,000,000 (N800, 000,000 and 960,000,000 respectively at N160 to a Dollar) for waterfront plots and $2,500,000 and $3,000,000 (N400, 000,000 and N480, 000,000 correspondingly at N160 per Dollar) for inner city plots. This has been interpreted as being ridiculously high. In her words, Ibezim-Ohaeri had described it as being “brazenly expensive…and 5 times more expensive than Ikoyi. Your wealth has to be higher than normal for you to be able to afford one (a plot)”.